Three months ago, we first released a special report on the video game industry. In that report, we talked about how the growth of eSports was outpacing that of traditional sports leagues. At the time of writing, the 2018 League of Legends World Championships were still under way. Last year the finals took place in the Incheon Munhak Stadium in South Korea, one of the stadiums built for the 2002 FIFA World Cup that was jointly held by South Korea and Japan. Two years ago, the 2017 League of Legends World Championship Finals drew in nearly a then-record 58 million viewers. How about the most recent championships? Last year, a mind-blowing 205 million League of Legends fans tuned in to watch the Finals. 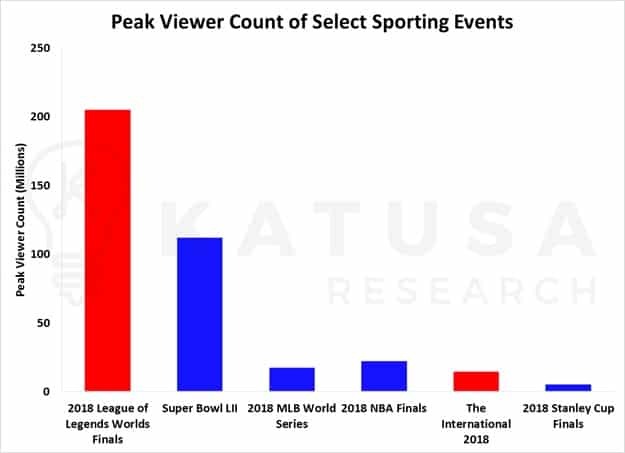 To put that number in perspective, the total viewer count of the Super Bowl, the NBA Finals, the World Series and the Stanley Cup Finals combined barely makes up 75% of that number. eSports is big. And it’s only just getting started. In 2016, Activision Blizzard announced the formation of the Overwatch League, a sports league based on their popular first-person shooter game Overwatch. The following year, twelve teams were established, and in 2018 the first competitive season was held. Following the first season’s success, an additional eight teams were added for the upcoming 2019 season. With city-based teams like those found in traditional sports, the Overwatch League is aiming to capture the interest of regular sports fans, who are more familiar with this model than those used in other eSports. For instance, as you can see from the graphic above, my own hometown of Vancouver BC is host to the Vancouver Titans. This team was purchased and put together by the Aquilinis, owners of the Vancouver Canucks – an NHL team. 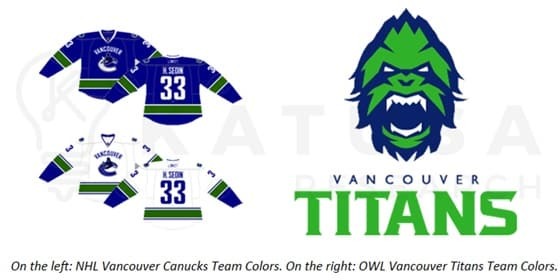 The Vancouver Titans logo shares the same color scheme as that of the Canucks’ team jerseys – and not only that, but home games for the Titans will be played in the Rogers Arena, where the Canucks play their own home games. While we don’t expect all of the local die-hard Canucks supporters to suddenly turn into eSports fans overnight, there’s no denying that the Aquilinis are banking on converting at least some of the hometown crowd through tying the two brands together. And with twenty teams spanning the globe, the Overwatch League is definitely setting itself up to attract more than just the usual video game crowd. Another good example is the NBA 2K League, which is an eSports league joint venture between the NBA and Take-Two Interactive, developers and publishers of the NBA 2K series of basketball video games. Currently, of the 30 different NBA teams, 21 of them have an eSports gaming team participating in the NBA 2K League. By leveraging the established fan base that each NBA team already has, the NBA 2K League is aiming to channel fans of each NBA team directly into their eSports equivalent. And eSports is gaining legitimacy, not only by appealing to spectators and fans, but also to players as well. The NBA 2K league pays each of its contracted players $32,000-$35,000 in base salaries per season. This is without counting any endorsement deals or tournament winnings. While this might not sound like a whole lot of money, players also receive benefits such as free housing as long as they are contracted (complete with relocation compensation), medical insurance, and even retirement plans. And while not all eSports follow this traditional sports league model, those that don’t make up for it in other ways: with tournament prize pools. 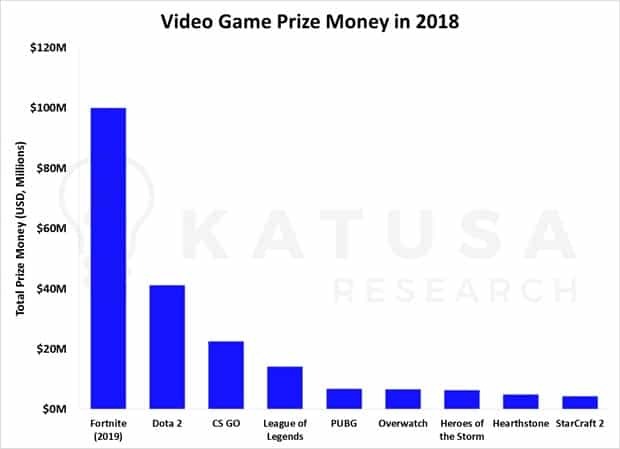 As the chart above shows, eSports prize pools feature some pretty serious money, especially for the video games where players aren’t paid any salaries and instead can only rely on tournament winnings. Dota 2 was previously the premier example for this, with no set player salaries but their equivalent of a “world championships” called The International. The total prize pool was USD $25.5 million. Fortnite has decided to kick things up a notch, announcing a total tournament prize pool for 2019 of USD $100 million. It’s more than double what Dota 2’s prize pool was for all tournaments in 2018, combined. $100 million is a serious amount of money – a number that has drawn attention from both aspiring eSports athletes and casual fans alike. And we wouldn’t be surprised to see other games follow suit with larger prize pools next year.